I'm still playing a bit of catch up from being out of town over the long weekend, but I do have a printable for today. My boys and I spent yet another fun-filled weekend at grandpa and grandma's. Every time we leave there, I am in awe of the one-of-a-kind atmosphere my parents have created. I'm sure you know what I'm talking about. There's no feeling like home, is there? My family moved several times throughout my growing up years, but with every move my parents were able to recreate the special feeling of home- no matter what zip code we may have been in at the time. I've come to learn it doesn't matter where you are, but who you're with. You can create feelings of home anywhere! I've been tremendously blessed to come from a good home, and I wish for nothing more than to create that same environment for my boys. I want them to be good humans, and that definitely begins (and ends) in the home. I feel like I'm a good human, and I know without a doubt it has everything to do with the home I was raised in. 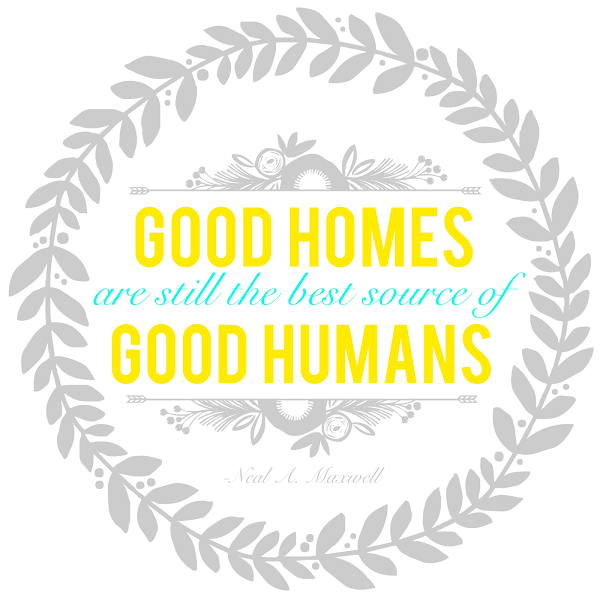 I hope we can all do our part to make sure good homes aren't just a memory of happier times. We live in a day when, for a lot of people, home isn't quite what it used to be. A home doesn't have to be perfect in any way, shape, or form, but we can most definitely make it a safe haven from the strains and worries of the world. What do you love about home? Unfortunatley, allowing you to print this printable by Rhonna's App is in violation of the EULA. You can use my image as a guide to create your own. Sorry! What a great message to share! Thanks, Brooke!